Hotel Vermont is an independent hotel that offers an authentic and unique Vermont experience. The Vermont-based project team worked together to ground the hotel's relaxed urban vibe in a deep respect for its place and namesake. The hotel's name itself is a reference to the original Hotel Vermont that operated 100 years ago, just a few blocks away. Praised locally as a prime example of the type of high-density, smart-growth Burlington encourages, this “garage-wrapper” infill building represents a major step toward reconnecting the popular Church Street pedestrian Marketplace with the Burlington waterfront, a connection long-severed by urban renewal at this corner of the downtown. Since opening, the Hotel and its two associated restaurants have created a substantial increase in foot traffic along Cherry Street, with guests venturing out, and the community venturing in. The Site - Before: Hotel Vermont turns a difficult site into a creative opportunity. The 124 room hotel recycles a previously neglected site on Cherry Street. The majority of the building fits into a narrow 45 foot wide slot in front of a City-owned parking garage. The site gains additional depth at the west end where the lobby and other public functions are located. The building must also straddle the entrance to the City garage, while the hotel bar and terrace step up to span over a second garage ramp from an adjacent hotel. The form and arrangement of the building program is a response to each of these different site conditions. The resulting design serves to break up a long street front with separate areas at the street level for the Hotel entry and public spaces, the City garage entry, and leased restaurant space to the East (Hen-of-the-Wood). The building facade was conceived as an assemblage of overlapping blocks corresponding to these different program areas, with the brick as background and the wood facade panels as foreground. To call attention to the main entry, a corner tower-like form was created by holding a portion of the building back from the street line above the two-story “cube” at the West end of the building. The exterior design is one of sharp contrasts between the parts, yet overall, the palette of wood, masonry, glazing, and metals is confined to warm, natural tones that harmonize with each other and with the neighbors. The building stands out by using a brown/beige/tan brick blend arranged in a tile-like pattern, but it also takes the most unique facade element, the natural wood panels, and ties it to the red brick context by selecting a deep amber tone. The design of the public street front emphasizes transparency. Large windows are placed at the reception desk, the elevator core, and the lounge area in the corner “cube.” From the sidewalk, one can see deep into the building across multiple layers of activity. The broad sheltering canopy extends the atmosphere of the hotel into the street and is an irresistible invitation to enter. The result is a hotel personality reminiscent of the International House tradition and mindful of the civic duty it assumed when it took the name Hotel Vermont. On the second floor, framed by the stage-like canopy, three hotel rooms with full glazing give a potential voyeuristic glimpse into the private side of the hotel. The relatively small footprint of the ground floor unfolds around the granite-clad elevator core which serves as both figure and ground to the carefully orchestrated composition of reception, meeting and entertainment spaces surrounding it. This series of overlapping, asymmetrical spaces flows around the core, leading guests on a dynamic journey through the hotel's public realm. The interiors are designed to engage the senses, exuding comfort and casual warmth while encouraging a sense of community. The lobby is a place for gathering, meeting, and lounging by the fire. 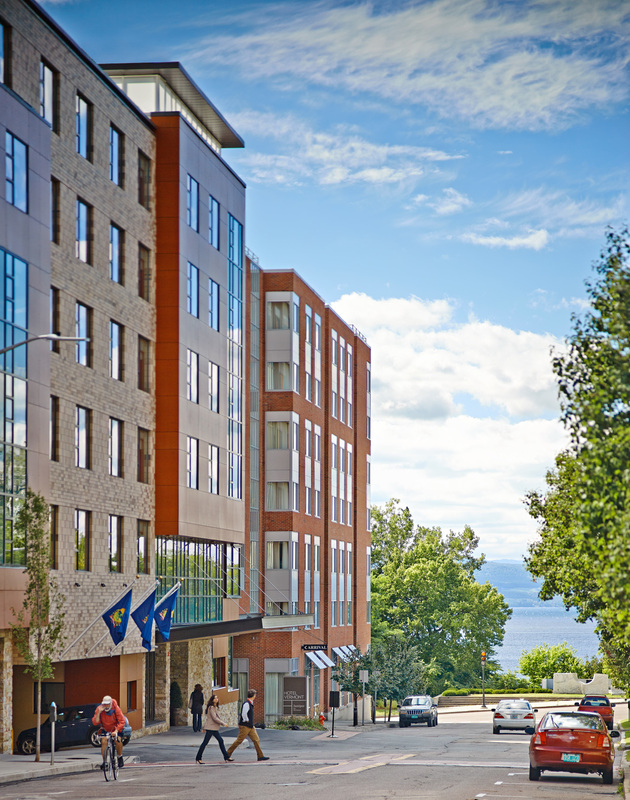 From here, steps lead up to the Juniper bar and lounge, with outdoor seating on the South Terrace and views of Lake Champlain. Throughout the hotel, local masonry, wood, metals, furnishings and art are combined in a modern composition. The ceiling of the grand canopy, dramatically falling away from the facade above, is clad in tongue and groove white oak. Middlebury Blend stonework, laid in a random ashlar on the facade below the canopy continues inside forming piers at the vestibule and the base of the long window seat at the lounge area. Polished concrete floors, infused with shells and stones from the Lake Champlain basin, greet travelers inside. The central core is clad in large slabs of Vermont black granite, arranged as an abstract reference to the geometric markings left behind on the quarry walls. With assistance from the Burlington City Arts program, the Hotel has developed relationships with many local artists. Unique pieces are scattered throughout the building, including photographer Don Ross’s studies of Vermont granite quarry walls strategically placed adjacent to the granite-clad elevators. The major work in the Hotel sits prominently on the wall behind the front desk. The colorful wood mosaic by Duncan Johnson is made of discarded scraps from landfills and construction sites and creates a dramatic effect reminiscent of Vermont’s quilting heritage. 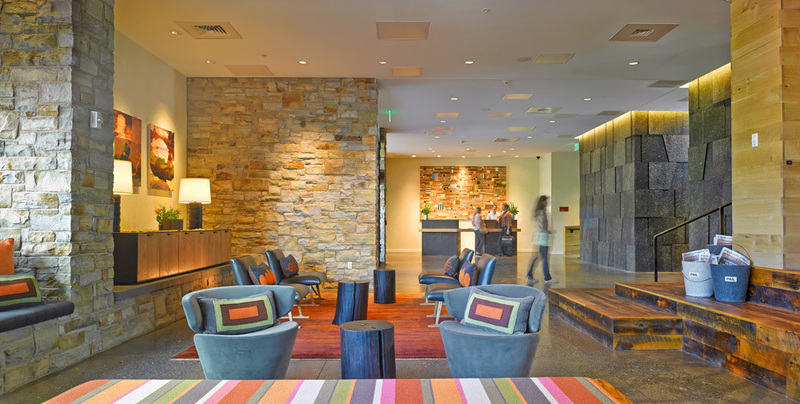 The furnishings designed for Hotel Vermont utilize natural materials of the Green Mountains in a contemporary Vermont collection for hospitality use. A clear example of this is the lounge chair that sits in the hotel lobby, crafted by local woodworkers in the neighboring town of Shelburne. The chair's wood base takes the form of the classic Vermont sled, evoking fond memories of snowy hillsides. Early on, Hotel Vermont met with local businesses to find out what unmet needs could be accommodated in the new building. The number one demand was for fun and unique off-site meeting spaces. So the design team worked to create four very different meeting rooms. On the ground floor, just off the Juniper lounge and with access to the terrace are a board room and a connected larger function space. Both have views across the terrace to the Lake beyond. The board room is connected to Juniper Lounge through a large barn-style sliding door. When the door is open, this room becomes a semi-private extension of the Juniper space. One level up and overlooking the terrace, is a green roof deck attached to a mid-sized conference room. Across the elevator lobby, on the Cherry Street side, the second level of the “cube” houses another mid-sized meeting room with a floor-to-ceiling corner window commanding views down Cherry Street to the Lake and the breakwater beyond. The meeting rooms on level two are conveniently connected to the ground floor lobby by an open stair that bisects the lobby between the lounge and the reception areas. The Juniper Restaurant and Bar is designed to transform throughout the day from a breakfast bar in the morning to a comfortable lounge by night. The materials used throughout the bar and restaurant are both rustic and modern. A copper bar with a black slate wall anchors the space, and the floor is finished with a wide plank red oak, salvaged from the Vermont forest floor. The natural materials and custom crafted interiors are a reflection of Juniper's farm to table ethic, focusing on small, local producers. The bar serves morning pastries, small producer coffee, and afternoon tea service. In the evening, Juniper offers farm-inspired "carbon-negative" cocktails - using ingredients that balance the hotel's carbon footprint - as well as limited-production beer and wine and small plates. Juniper offers a seasonal menu of localvore entrees and creative cocktails. Guests may share a meal with friends at the free flowing community table crafted of reclaimed Vermont hardwood, partake in a more intimate dining experience among the artistically sculpted trees in the dining room, or enjoy sunset on the terrace. The terrace is organized around a gracious cor-ten steel fire pit and has become a favored three-season gathering place in part for its view out to Lake Champlain across the 7,500 SF green roof garden below. On the east end of the ground floor, with its own door to the street, Waterbury sensation Hen-of-the-Wood opened their second location to much anticipation. The low-key entry is flanked by contemporary interpretations of old gas lanterns. Inside, regulars will find a bigger, more modern evolution of Hen’s original gristmill space in Waterbury. Open hardwood grilling and a wood-fired custom-made brick oven mix with rustic found woods, vintage lighting, and modern forms for a dark, cozy dining experience. Guest-level corridors feature wood-clad walls at the elevator lobby and the tall recessed guestroom doors are surrounded by substantial wood portals crafted in white oak. The portals feature integrated lighting and set up a rhythm of sculptural elements in the hallways in lieu of artwork or other added adornment. The narrowness of the site necessitated the unique square shape of the guestrooms, which led the design team to a ‘split’ bathroom configuration with corner sliding doors that open wide into the room. Room offerings range from single king and double queen rooms up to 1-bedroom suites. Deluxe features include gas fireplaces and whirlpool tubs. Rising to meet the tall 9’-2” concrete plank ceilings are headboards crafted from character-grade White Oak, with a cantilevered brim that supports a pair of intimate accent pendants. Large 6’ x 8’ windows with natural wood trim fill the room with light. Each window group contains an operable awning window which guests can control. A built-in window seat makes maximum use of space in front of the windows and integrates seamlessly with an adjacent desk and dresser unit. Eschewing the conventional in-room coffee maker, vending machines, minifridge and plastic bottled water, Hotel Vermont invites guests to use one of the community pantries located on each floor, where eco-conscious guests can fill their pottery mugs with Green Mountain Coffee, or flat or sparkling water, and help themselves to fresh fruit, pastries and other wholesome goodies. Health and wellness is culture in Vermont, and the hotel reflects this with a generously sized fitness area that includes a discreet yoga studio room for those who want to practice their art in a separate space. 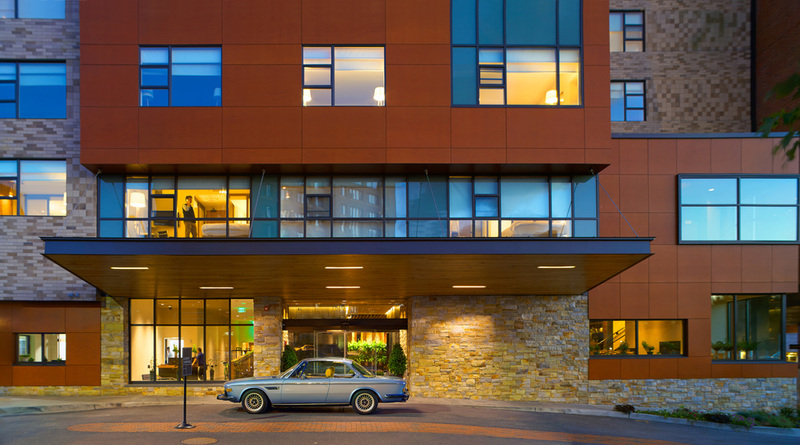 From its choice of site, to its relationship to the street, and in spaces public and private, the design supports the hotel's mission: celebrating the resourceful spirit of Vermont with an authentic understanding of its past, present and future.